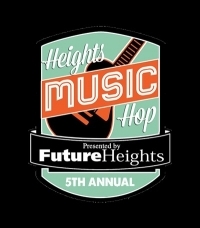 Join us for the 5th annual Heights Music Hop, which takes over the Cedar-Lee district on Saturday, September 9 from 3:00-11:00 p.m. We are thrilled to be hosting two groups: Patchwork and Math + Logic. Parking will be free at city meters for the evening. Mutually interested in exploring a wide range of contemporary genres, Noa Even and Stephen Klunk formed Patchwork, a Cleveland-based saxophone and drum set duo that collaborates with composers to build an eclectic body of new music. Since forming the group in 2013, Noa and Stephen have commissioned over a dozen works for their unique instrumentation. Patchwork has appeared on many college campuses, and they frequently combine performances with educational events such as composer readings, master classes, and presentations. Their recent tours included shows at Array Space in Toronto, the Bop Stop in Cleveland, Constellation in Chicago, Spectrum in New York City, and Omaha Under the Radar. Math + Logic is an indie piano rock group made up of pianist and composer Rob Kovacs, David McHenry, Charlie Trenta and Dan Kshywonis. Formed in 2017, the group has performed locally at the Beachland, Happy Dog,Grog Shop, and other popular Cleveland music spots.